The article below concerns the sharing of pulpits between Muslims, Jews and Christians in a display of religious freedom. This is a disturbing practice that should not be followed by evangelical and reformed churches. The pulpit is a place for the proclaimation of the truth and is not to be polluted by every wind of doctrine. A more thorough treatment of this issue is certainly warranted but will not be given here at this time. I am totally for religious freedom and believe that Muslims and Jews, as well as those of other faiths, have a right to worship according to their conscience. This does not mean that I believe their faiths to be right or acceptable before God, only that they must stand or fall before God and not I. However, as Christians we are obligated to remain steadfast in the truth and to not open any avenue in our churches for that which is not the truth. Unresolved charge of ‘defaming religion’ leaves him in perpetual limbo. CAIRO, Egypt, December 16 (CDN) — An Egyptian who left Islam to become a Christian and consequently lost his wife, children and business is waiting to see if the government will now take away his freedom for “defaming” Islam. Ashraf Thabet, 45, is charged with defaming a revealed religion, Article 98f of the Egyptian Penal Code. The charges stem from Thabet’s six-year search for spiritual meaning that eventually led him to become a Christian. During his search, he shared his doubts about Islam and told others what he was learning about Jesus Christ. Local religious authorities, incensed at Thabet’s ideas, notified Egypt’s State Security Intelligence service (SSI), which arrested and charged him with defamation. If found guilty, Thabet would face up to five years in jail. But because prosecutors have made no move to try the case, Thabet lives in limbo and is subject to a regular barrage of death threats from people in his community in Port Said in northeast Egypt. Thabet said that before his search began he was a committed Muslim who did his best to observe its rules, including those for prayer and fasting. Despite his efforts, Thabet admitted that his understanding of God was based on fear and routine, nearly rote obedience. Thabet started looking at Christian Web sites, but his real interest in Christianity began when he watched the film, “The Passion of the Christ” in 2004. His friend, a Christian Copt, did not get him a Bible until a month later because, Thabet thinks, he was afraid of being accused of proselytizing. Thabet began reading the Bible, which had a powerful impact on him, especially the Sermon on the Mount. Thabet was also struck by the lives that the early followers of Jesus led, especially their willingness to lose everything, including their lives, for Christ. Thabet said he cared about others “going the right way,” so he started having conversations with Muslim friends. At first, people respected Thabet or tolerated what was seen as an awkward curiosity. But after he told his friends they were “only Muslim by inheritance,” they started to turn against him. They asked him what he was going to be if he wasn’t going to be a Muslim. “I told them I started to read about Christianity, and I was starting to believe in it, and that’s when they brought the elders to talk to me,” he said. The meeting didn’t go well. The Islamic leaders were unable to answer his questions and ended up yelling at him. Then they reported him to the SSI. The SSI summoned Thabet and questioned him on his doubts about Islam. Thabet said by the time he was done with the interrogation, the SSI officer looked almost sick and told him not to talk to anyone else in Port Said about religion. “I don’t encourage you to talk about these things with people or to open up these types of discussions, because it will just provoke people and make them angry,” the officer told him, according to Thabet. Two days later, Thabet said, the SSI ordered him to report for more questioning, this time with an officer who specialized in religious issues and countering missionaries. The officer wanted to know what made him start to doubt Islam. He asked specific questions about what Web sites he had been on and what books he had read, and whether he had been baptized. Thabet said that at the time of his questioning, he was still struggling with his new beliefs. Part of him wanted something that would restore his faith in Islam, so he went to Internet chat rooms for religious discussion. Thabet said he was always respectful, but Muslims found his questions provocative and became increasingly angry. Eventually police came for Thabet. On March 22 at 3 a.m., he said, 11 officers from the SSI cut the power to his home, kicked down his front door and assaulted him in front of his crying wife and children. Thabet quickly pulled away from the fight, once he realized they were officers from the SSI. The men swarmed over Thabet’s home, seizing his computer and every book and CD he owned. They took him to jail. Authorities interrogated Thabet non-stop for 12 hours, took a break and then interrogated him for seven more, he said. Initially he was held for 15 days. Then authorities ordered he be held for another 15 days. Then they extended it again. Thabet said he spent the entire time in solitary confinement, and he wasn’t informed of the “defamation of religion” charge against him until the end of 132 days in jail. He said he was not tortured, however, and that his interrogators and jailers were largely civil. There was more hardship waiting for him at home. Muslim leaders in his neighborhood convinced his wife to divorce him and take his 10-year-old daughter and 6-year-old son. Thabet has only had a few brief moments with his children since he was arrested, mainly when his soon-to-be ex-wife came to their home to gather a few belongings. If she goes through with the divorce, according to Egyptian law it is likely Thabet will lose all parental rights to his children, including any right to see them. In Egypt and most other Muslim-majority countries, leaving Islam is considered ample grounds for termination of parental rights. Thabet said the religious leaders consider him “lost to Islam” and are trying to “save” his wife and children. He filed a report with police about the Muslim leaders bribing his wife – and about another man who swindled money from him – but police ignored both reports, he said. Arrests like Thabet’s are common in Egypt. “It is a tactic used to intimidate people and scare them from leaving Islam and taking alternative beliefs or moral codes,” Fahmi said. In Islam as it is most often practiced in Egypt, merely expressing doubt about Islam is considered wrong, Fahmi said. Questioning any of its claims is considered blasphemy and is punishable by imprisonment under a variety of charges in Egypt; it is punishable by death in some other countries. Thabet said he is uncertain what the future holds. He was released on Aug. 1 but, because he has the defamation of religion charge over his head – with no indication of when the case could go to court – he is unable to work and cannot even obtain a driver’s license. His savings are almost depleted, forcing him to borrow money from a Muslim friend. He is concerned about re-arrest and receives death threats on a regular basis. He is too afraid to leave his apartment on most days. On numerous occasions while talking in Internet chat rooms, he has been told, “Look outside the window, we know where you are,” Thabet said. He said he wants to leave Egypt but admits that, at his age, it would be very hard to start over. And if he stays in Egypt, he said, at least he will have a chance to see his children, however brief those encounters may be. Since Thabet was released from jail on Aug. 1, authorities have seized his passport and summoned him four times for questioning. He said he thinks the SSI is trying to wear him down. My first choice would be Jesus Christ, because I’m a Christian. However, if not Jesus and someone else (I know the Plinky Prompt didn’t ask that specifically) then who to choose? 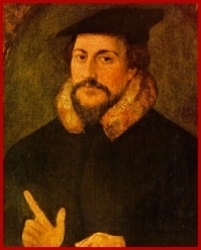 I would probably have to say John Calvin, the Protestant Reformer. Why? I admire Calvin greatly – not that I agree with him on everything. He was a strong believer who was used much of God in Geneva. For someone who followed the Lord and his rock solid faith rooted firmly in the Scriptures, it has to be Calvin.